Many games feature amazing animals that help you along your quest, maybe as a companion or a sidekick. Honor your game animals by featuring them in your esports team logo. There are many types of animals to choose from, is your game developing in the sea? 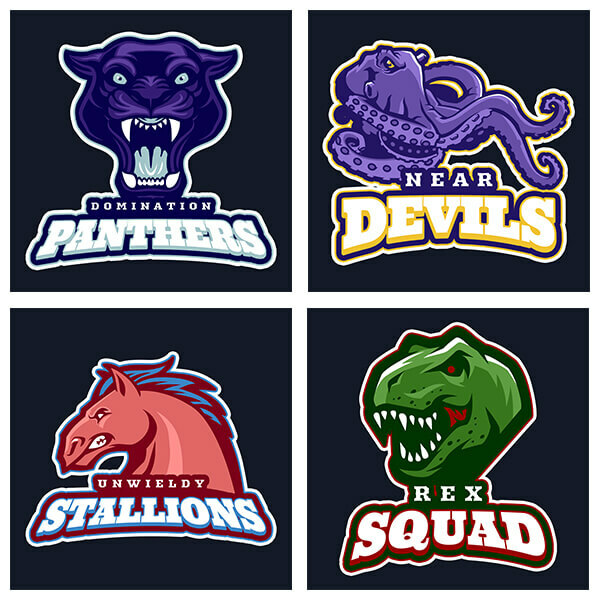 Choose a sea creature for your logo, maybe you like dinosaurs or big cats, the t-rex, and the panther can help you channel your inner beast. Pair this with a cool name and you’ll have a logo to impress even your fiercest competitor. What about natural disasters? They are powerful, unpredictable and they destroy everyone in their way. Isn’t that a way you’d like your opponents to think of your team? Make sure to choose colors that you’d like to have on other merch as well (stickers, lanyards, gaming jerseys) and choose a name that can destroy as much as the icon in the logo. Your gaming clan logo will be known as one that puts fear into your opponent’s heart. Think about how many fantasy games are out there, gaming team logos can reflect this as well, it only makes sense. 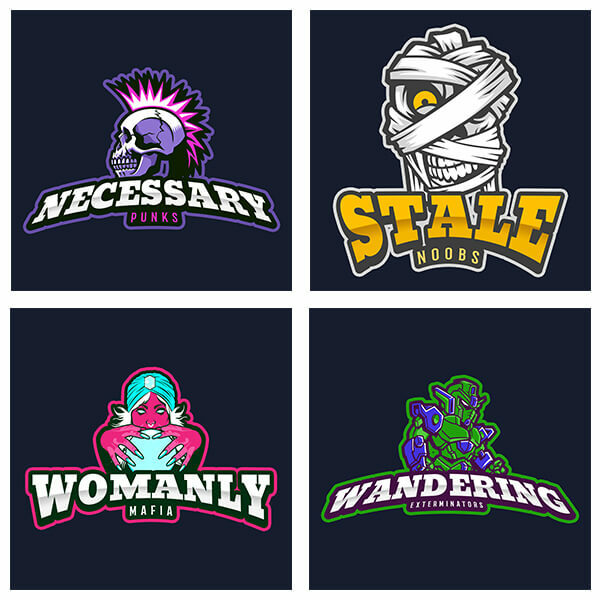 Whether you decide to go with a mummy, a punk zombie, a mystical fortune teller or a robot that can destroy a whole city, think that the logo is the first thing your fans and sponsors will think about when they think about you. Make sure the first impression is the right one. 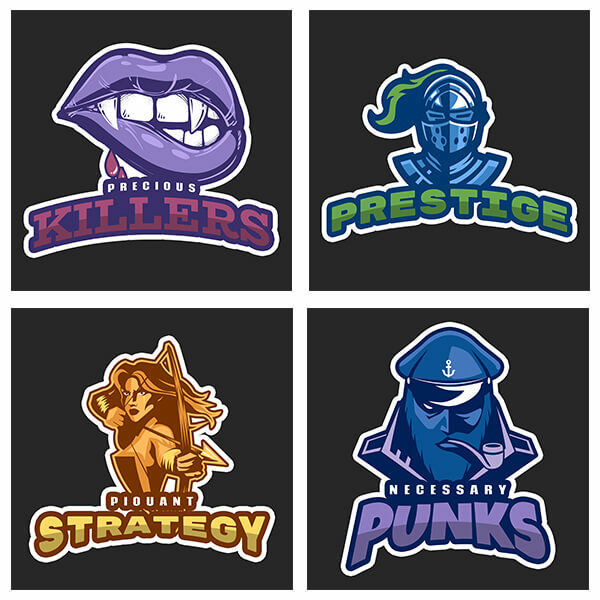 Human character logos is another realm you might want to explore, there are many legendary figures across time from where you can get inspiration for your gaming logo. From creatures of the night such as vampires to knights that fought for their queen, all the way to archers and sailors, there are many human (or semi-human) characters to choose from. Once you have a high definition logo, you’ll be able to place it in all types of merch like hoodies and t-shirts, promotional materials like posters, mugs and tote bags and even to fundraise for your team because traveling the world playing esports events isn’t cheap. Make sure your logo is everywhere to be seen and start building a brand that fans will want to be a part of. 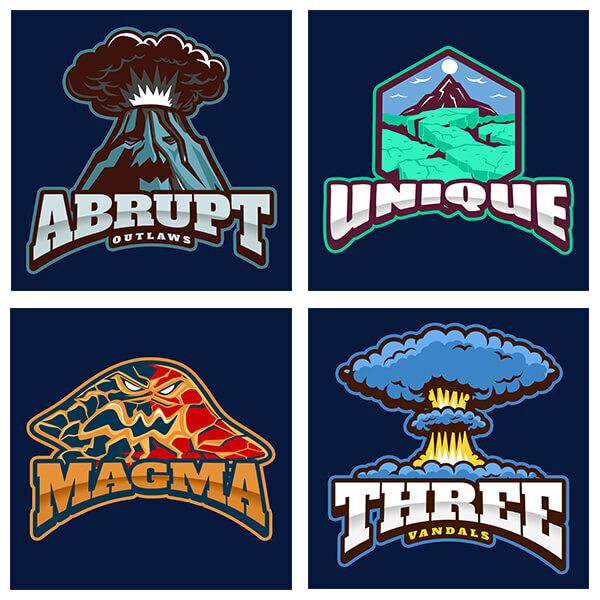 With Placeit’s gaming logo generators, you’ll be able to design an esports team logo in minutes, download it and use it in whatever way suits your team. What’s the standard size for a gaming logo? Well, it depends on what you want to use it for, but once you click download you’ll get a high resolution 4000 x 4000 px PNG image, big enough to print out for a huge display or to print on a team jersey. Remember that having a cool gaming logo can help you promote your esports team or gaming clan with sponsors and fans alike. Having a logo will set you apart from the rest and help people take you seriously as a professional team. 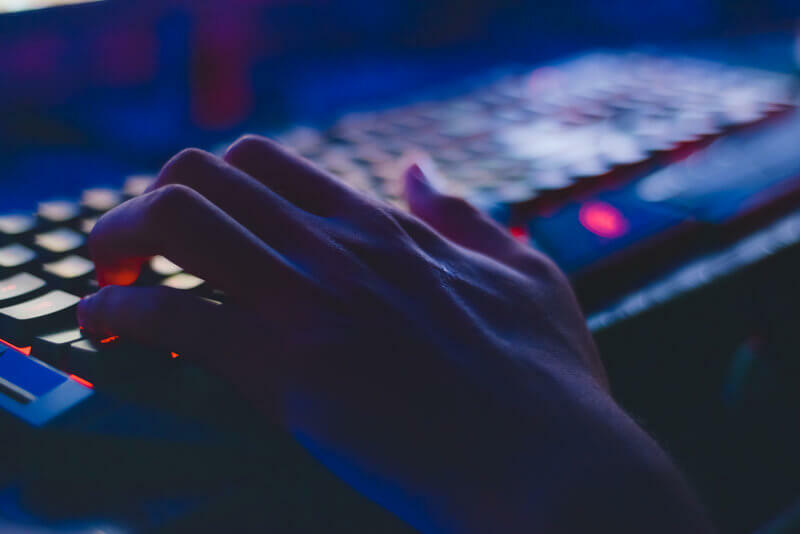 If you’ve just recently started streaming on Twitch, check the Twitch tips and tricks that our in-house streamer kindly shared with the internet, and start branding your channel with Twitch banners. You might also interested in Best Soccer Team Logos in Movies to get inspired by the fictional team logos we’ve seen in movies! Any professional sports team has a logo to rally behind, and it doesn't hurt that sponsors and fans can easily identify it. 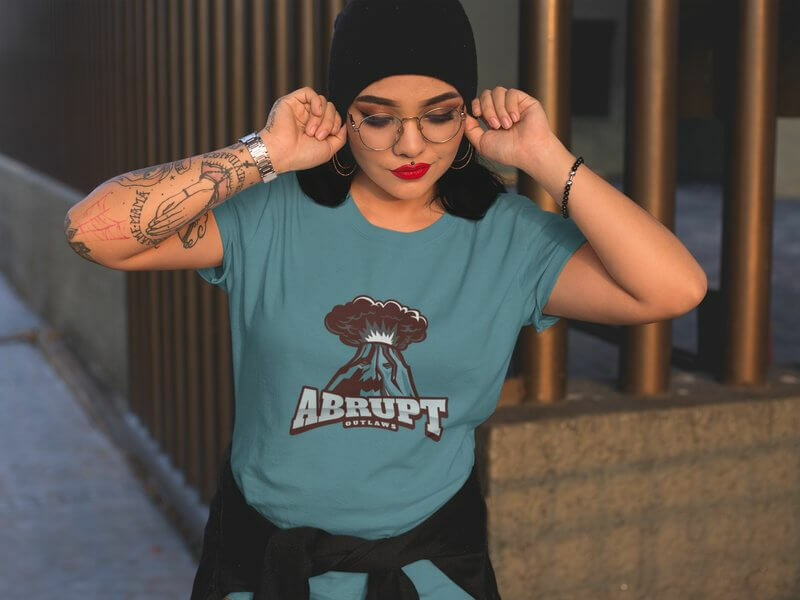 Make sure that yours is unique and professionally made with Placeit's eSports logo makers. Create one now by selecting an icon and adding your team name, it's quick and easy and you won't have to hire a designer, you can do it yourself. Also, Placeit has mockups to help you promote your team merch that are easy to personalize without the need for Photoshop or any expensive design software. "My logo came out looking great withPlaceit's sports logo maker"